In addition to sandy, pristine beaches, the metropolis of Perth delivers gardens, scenic parks and a host of opportunities for foodies and art lovers. There are multicultural events to suit people from all walks of life. 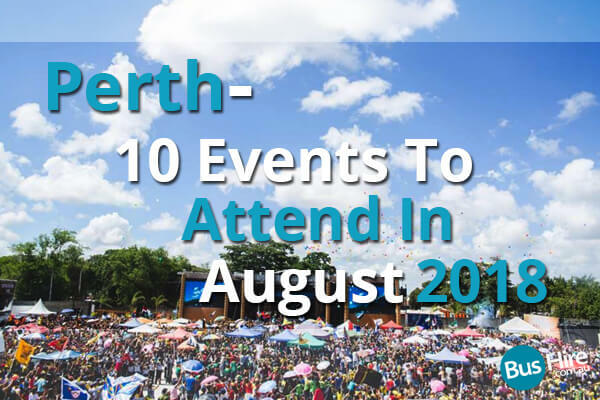 Choose Perth bus charter to attend some of these handpicked events in August 2018. The latest show by Serial Productions is here to entertain one and all with crazy comedy, exposing the foolishness of life. Directed by Rob Warner and written by Larry Shue, the Foreigner takes place in a fishing lodge, where Englishmen Charlie and Froggy arrive as guests, but Charlie is quite fearful, shy and depressed. Froggy claims that he can’t talk, as he doesn’t understand English, being from a foreign country. The show culminates in a comical climax and heart-warming ending. The event scheduled to be held on the 4th and 5th of August will have over 75 exhibitors, displaying diverse use of technology and robots in care and ageing at the Perth Convention and Exhibition Centre. The exposition will be a one-stop destination for families looking to provide support to their guardians and for people planning their latter years. Exhibitors will be ranging across categories from home care to technology, support groups, medical consultants, services providers, healthcare and equipment. The Avon Descent festival on Sunday, the 5th of August will take place at the Lilac hill. Throughout the day, you can enjoy a jam-packed schedule of onstage entertainment with performances by Zap Circus, Junkadelic, The Lulus and Duncan Saige. Add to that, you can tuck into cracking gourmet food truck fare, discover the community art installation by Mundaring Arts Centre and enjoy a special edition of The Vintage collective markets. Adding to the vibrant community ambiance are inflatables and fair rides in the Swan Valley giveaways, a Midland Gate Massage Retreat, drumming workshops, giant bubbles and Movida Fun Zone. Known to be a fascinating show of indigenous articles, Bibbullmun Bardi explores aboriginal design rejoicing the seldom told stories of some of the design icons of Western Australia. You will witness how modern designers include their cultural perspectives and practices to today’s world. Each garment has a story, and it is shared through interviews, photographs, samples, sketches, accessories and clothing. The event will take place at The Nook, State Library of Western Australia, and moreover, you don’t have to pay anything to attend the same. As a part of National Science Week, the Pawsey Supercomputing Centre Open Day will take place on the 11th of August. It is a wonderful opportunity to explore what goes in the background of big science in Australia, as you meet some Pawsey experts. This centre is home to some of the most powerful supercomputers in Southern Hemisphere. Come together to learn more about the history of supercomputers and the benefits they can bring to the table, in order to help national advancement and growth. You can also meet ‘Magnus’, which is known to be one of the fastest supercomputers in the world. Join us for a fun day, and explore how supercomputing is allowing researchers to do groundbreaking work, in an interactive environment. Perth is a city that is never short of craft beer. From 17th to 19th of August, top 50 cideries and breweries in Perth will bring an astounding range of beers and ciders to the Perth Craft Beer Festival, which will be held at the Ice Cream Factory. Just some of the names on the line-up include Matso’s Broome Brewery, Little Creatures, 4 Pines, Feral Brewing and Gage Roads. One can also sample boutique beers from brand names such as Beerfarm, Pirate Life and Artisan Brewing. There will be something to suit everyone’s taste. Possibly the largest celebration in the city, the Perth Science Festival from the 18th to 19th of August will witness over fifty hands-on activities, stores for buying science products and arts exhibitions. The festival will have plenty of exhibitors from across Western Australia, exploring a variety of areas, from robotics to forensics, and astronomy to marine biology. This prestigious event will be held at the Claremont Showgrounds. Fancy watching a comedy hypnotist show this August’18? On the 22nd of this month, come along for a night of laughter, as Matt Hale will take the stage to perform his highly anticipated and popular show Hipnolicious. It is a must visit for anyone who has not seen him, and in case you have, you know how good a show he can put on. This 90-minute show will take you on a laughter ride in Fremantle, with dinner starting from 6 PM. Matt Hale has amazed and vowed fantastic crowds across the world. The Twilight Market Series is coming back this 24th of August to the most popular community, Yagan Square, right in the heart of the city. With sparkling display, shopping precincts, restaurants, pop-ups and cafes, Yagan Square is now hosting a Twilight Market as well. The event will bring together a curated assortment of stalls with artisan products. See the best that the city has to offer, with delicious cuisines and a variety of items on sale, including homewares, jewellery and crafts. More than 70 stalls will be taking the ground during the market, alongside free children’s activities as well. Calling all of Muggleborns, Halfbloods and Purebloods, the Harry Potter’s 21st celebrates 21 years, since the tales of Harry Potter began. On the 26th of August, you can have a day-pass at Hogwarts School of Witchcraft & Wizardry to rejoice these years of Harry Potter. If you are a VIP guest pass holder, you will also help in raising funds for Guide Dogs WA, while also enjoying the event. The Hogwarts Express will be leaving the Dwellingup station for a 2-hour steam train trip.